Q’ is the heat flow between the Sun and Earth and so is not the solar energy. The solar energy flux would be a term on the right hand side, σT24 say, but factored for distance. How this is done is demonstrated in the link above. Q’ is actually zero if we consider the Earth to be in energy equilibrium with the solar input, which it should be within a small margin. So to repeat, Q’ can not be the solar heat input, when T1 and T2 are supposed to be the temperatures of the atmosphere and surface. That’s not what that equation is about at all. Q’ is not an actual radiant emission corresponding to any temperature and hence is not subject to any valid algebraic manipulation as if it supposed to be a conserved quantity from some source. It is not a conserved quantity and it does not represent a source. Q’ is actually Q'(net) – the difference between two emission powers from 2 objects. This is easily observed on a Planck curve diagram. σT14 is the area between the Planck curve and the x axis for T1. σT24 is the area between the Planck curve and the x axis for T2. 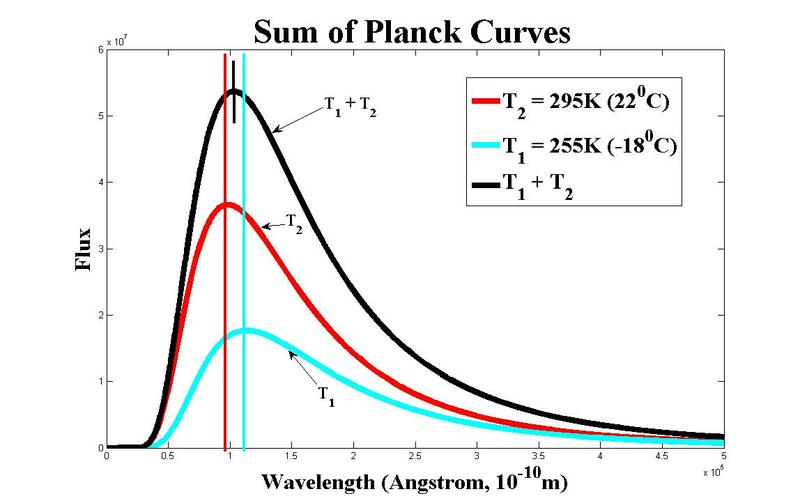 If T2 > T1 then the area of the Planck curve for T2 completely includes all of σT14. But Q’ = Q'(net) = A*(σT24 – σT14) is not a radiative flux at all. 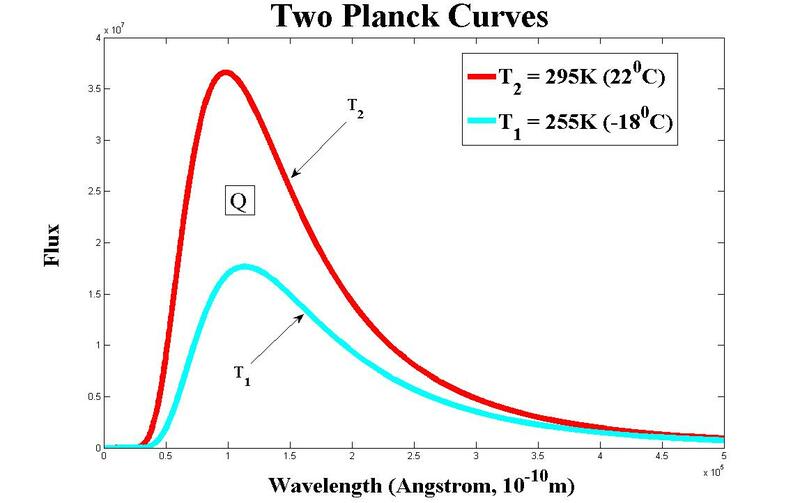 It is the area between the T2 Planck curve and the T1 Planck curve! Only the T1 and T2 terms have any relationship to the Stefan-Boltzmann equation because they are explicitly derived from Planck’s equation as the integral from 0 to infinity of Planck’s equation in either df (frequency) or dlambda (wavelength) terms. If T1 = T2 then Q'(net) = 0 this simply says that two objects at the same temperature have zero net energy exchange and therefore no thermal effect on each other. If T1 is less than T2 then object 2 is heating object 1 and raising its temperature. This demonstrates the ridiculous nature of all “greenhouse effect” “physics” – they simply play algebraic tricks without any recognition of what the terms actually mean. F1 = σT14 is a valid flux for T1; F2 = σT24 is a valid flux for T2. Q’ = A*(σT24 – σT14) is just a number, just the difference of the fluxes – nothing more! It is not a source in itself. It is not conserved. You can’t hold it constant and say that an increase in the cooler T1 will cause an increase in the warmer T2, i.e., that cold can heat hot. To manipulate this expression by algebra and claiming that Q’ has to remain fixed because it is the energy from the Sun is entirely nonsensical by the terms and logic of the equation itself. What happens to the energy from the cooler portion if it travels to the hotter side but does nothing? How can it do nothing? Does it even travel to the hotter side at all? How can it not? How could it know not to? How could the photons from the cooler side either A) not cause any heating when they get to the hotter side, or B) not travel to the other side at all? These are all related questions. To be sure, the equation we’ve been discussing for Q’ absolutely, most definitely, 100% says that radiative heat energy only goes from hot to cold and thus that temperature can only be increased by something hot warming up something cooler. It specifically does not result in something like the supposed “steel greenhouse effect”, as debunked previously. And this equation is the correct equation from radiative transfer theory and thermodynamics, when used and interpreted properly. It says what happens, and so it appears that the problem is that it doesn’t say why that happens. The integration over all the active microstates of a system determines its macrostate, and the macrostate is the thing you actually measure to take a temperature. If you activate higher-frequency microstates, then you shift the macrostate to a higher temperature. But you can only activate the higher-frequency microstates with the frequencies required to activate them, which are obviously their frequencies. And so because the radiation from a cooler source lacks the higher-frequency microstates that the warmer source of radiation already has, then the cooler source can not have the effect of raising the temperature of the warmer source. And obviously the same would be true of two systems with identical temperatures – they could have no effect on each other’s microstate population, hence can not heat each other. Now you can’t see it because the lines all overlap each other at high energy (i.e. short/small wavelength), but the cooler curve has zero contribution, zero activated microstates, at the high energy, high frequency, short wavelength end of the plot (left side) where the warmer curve does have populated microstates. Thus, adding the cooler radiation with the warmer radiation doesn’t result in a macrostate that has microstates activated at higher frequencies as compared to the original warmer radiation (T2), and thus, the result doesn’t have a higher temperature than the original warmer source of radiation . Also note, and this you can see, that the peak of the population of microstates for the sum of the warm and cool source radiation is at longer wavelength and thus lower energy than the original warm source radiation. Adding cool to hot doesn’t result in something hotter…but adding hot to cool certainly does result in something hotter. But still the question can be asked: Why doesn’t the addition of energy from the cooler source to the warmer source result in an increase in temperature for the warmer source? If you add any energy to anything, doesn’t that have to result in an increase in internal energy, and thus temperature? The answer to that, is “No”, because that is not how thermodynamics works. It’s not what the radiative heat transfer equation says or how it works. We actually shouldn’t have added those fluxes together at all because that is not how heat radiatively transfers. If we add those fluxes, then is that now the flux that the hotter object emits, or is it the cooler objects? Or is that the radiation field between the two objects? None of those are correct. It was wrong to add those fluxes together. It is easy to make that mistake, but on the other hand, we’ve always had the equation for radiative heat transfer at hand and so we should simply refer to it and obey it. The energy field flowing as heat between the hot and cool objects is only Q’, only the difference between the hot and cool fluxes. You can see a little more clearly now that Q’ (Q in the diagram), the heat flow, merges to the hotter curve at high frequency/small wavelength, which again is all about how only the hotter source has active microstates at high frequency, and the cooler curve doesn’t. 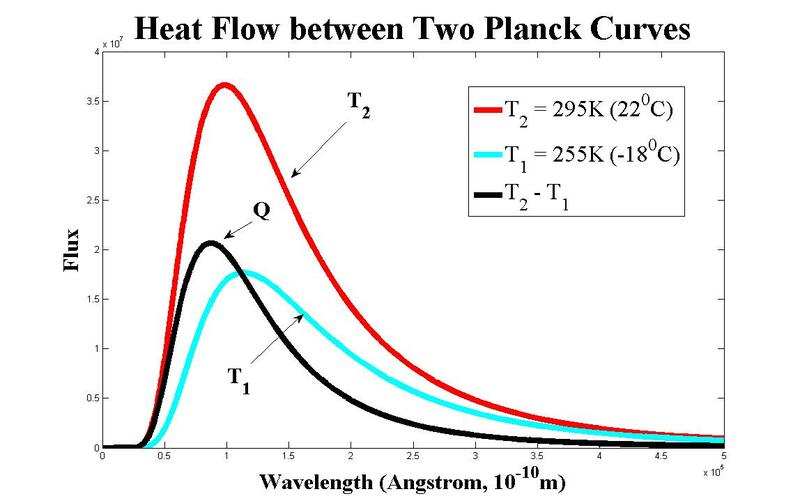 If you add the Q curve, the heat flow, to the T1 object’s curve, then you get the T2 curve, which would indicate that object 1 has come to the temperature of object 2 in thermal equilibrium, and then the heat flow Q’ would be zero, meaning that no more temperature changes can occur. Object 1 & 2 become a unified thermal system on the side facing each other, and object 1 then simply emits the energy supplied by object 2 out from the side facing way from object 2. When you have say, two planes of material, touching each other, then the heat flow would be purely diffusive, meaning purely by conduction. The addition of another layer physically touching the existing warmer layer doesn’t make the warmer layer warmer still – the new layer simply gets heated to the temperature of the original layer, and then it becomes the new surface of the original warmer plane. Nothing about this changes when there is a gap between the layers so that the heat transfer between them become radiative. It’s not like you would remove the added layer from touching the original one to create a vacuum gap in between, and suddenly this would cause the warmer layer to become warmer still, when this is not what happened when the layers were touching. The modes of heat transfer obey the same limitations and the same general rules of heat flow. The Solar and Terrestrial fluxes are scaled for distance of the Sun from Earth, and for 4-times the emission from a sphere for the Earth as compared to the disk cross-section of absorption. However, as we calculated in the steel greenhouse debunking thread, the radius of heat potential for the Earth only extends to 56.8 million kilometers before the terrestrial heat becomes indistinguishable from the cosmic background thermal radiation. Therefore, the Earth can not heat the Sun with terrestrial backradiation (because the Sun is 150 million kilometers distant), and that will always be a general result in any scenario. Of course, as you go back towards the Sun, the solar flux spectrum increases in intensity and so well before reaching the Sun, the flux from the Earth will become dominated by the outward flux from the Sun at those wavelengths. The flux intensities from the Earth vs. the Sun, at the wavelength of the peak of the terrestrial spectrum, become equal at 27.1 million kilometers distance from the Earth towards the Sun, which is well inside the heat envelope of Earth. All of the GHE advocates make this same mistake of misinterpreting the meaning of the terms of radiative heat transfer equation. They all have this idea that Q’ is a conserved quantity as if is the energy flux from the Sun. This is wrong. How surprised would they be if they realized that Q’ was actually zero, given that we generally assume a state of thermal equilibrium between the solar input and terrestrial output, thus requiring that Q’ equals zero? Furthermore, if they make such a basic mistake with such a simple and basic equation, then how can you really trust the rest of what they’re doing? This is first-year undergraduate level stuff, and not only does it seem entirely beyond them, they actually get extremely angry and hostile when you ask them to read up on it and correct such a simple mistake. But we have one last amazing thing to think about with regard to radiation. Sure the stuff about energy microstates and thermodynamic macrostates is all very interesting, and describes what happens to some degree, but still people may wonder: Why do those fluxes not add together if their energy is in the same region of space? What happens to the radiative energy if only the difference, not the sum, has an effect on inducing temperature changes? How do the photons “know” how to do this? Well firstly, that is exactly how vectors behave. This Wiki article on heat transfer physics is a little mathematically advanced, but the term we’ve been denoting as Q’ here is a “heat flux vector”. Opposing vectors subtract, not add. And finally, think of the way that the universe is experienced by a photon. A photon travels at the speed of light and so time is infinitely dilated and space is infinitely shrunk. A photon quite literally exists outside of space and time as we know it. It doesn’t experience time, and it doesn’t experience space! Just apply the Lorentz relativity equations with the subject in question being a photon, traveling at the speed of light ‘c‘. The equations directly say that neither time nor space is experienced by a photon. A photon has no distance to travel as far as it is concerned, since there is no space because all spatial length is infinitely contracted, and it has no time to experience because time has come to a complete stand-still with infinite time dilation. So a photon has no distance to travel, in no time – from its perspective, and we have to grant it its own perspective as per relativity theory. And so, under these conditions, a photon essentially does know what its destination is like and so radiative transfer of heat energy can be limited to the same rules as physical-contact flows such as with conduction. How does a photon from a cool spectrum source “know” not to travel to and warm up a warmer source? It is because a photon is effectively outside of space and time. Start thinking of what life as a photon must be like, if you were a photon, travelling at the speed of light, and wrap your head around that. Gallery | This entry was posted in Fraud of the Greenhouse Effect, Illuminism and tagged Blakcbody, heat transfer, Planck, radiative energy, radiative heat transfer. Bookmark the permalink. “F1 = σT14 is a valid flux for T1; F2 = σT24 is a valid flux for T2”? JP: So, If an electromagnetic wave from the sun is hurled towards earth, with high powered packets of photon energy (short wave radiation on the Planck curve) with some additional photons of less flux, and as it hits the atmosphere and magnetic poles of earth, the wave(particles) is processed (filtered) through the atmosphere, during which this process transfers radiant heat to the earth, where the short wavelength particles and the longer wavelength photons are absorbed, then, this flux is released in a diffusive process of entropy. During this diffusive process, some of the long wave radiation (IR) is sent into the atmosphere…yes, it can be absorbed by H2O, CO2, etc., but, as it is part of diffusive process of entropy, it can not return to the source to “re-energize” the original flux’s affect on the surface. Kind of like a huge wave hitting a cliff—the original wave packs the energy, and the subsequent frothing of the water is just residue. Does this make sense, without all the equations? I am studying the equations, and the physical process, but, sometimes I like to just try and use analogy. So, the Q is the difference of the two fluxes at a given moment–has nothing to do with one affecting the other. The stronger flux forces the action at that given moment, and the weaker flux is along for the ride. JP, thanks for all your efforts. That sounds about correct CW. The longwave radiation can’t do more than the original shortwave already did, and it is about entropy and thermodynamic laws etc. Real Planck curves also never cross each other but pseudoscience sums and differences do. 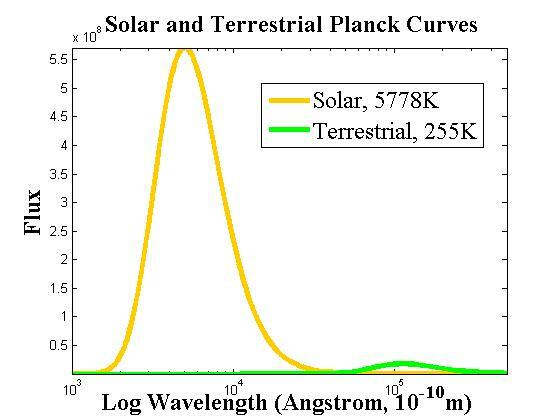 Of course the solar curve scaled by the inverse square law does cross Earth’s terrestrial temperature radiation curve. You can also note this occurs with an emissivity factor. What I interpret from this is that because sums of flux from real temperature curves cannot in general produce a real temperature curve this is not real science. In the case of the solar radiation the radiation carries the signature of the emission curve at say 5778 K – to quote NASA. This is why the Sun heats the ground and “backradiation” doesn’t. You can also plot curves for the photon flux which also. but perhaps even more obviously. shows why long wave radiation cannot be equated to shortwave radiation as stupid University lecturers do in all their climatology lectures. The shortwave radiation emits orders of magnitude more high energy photons than longwave radiation. In an exchange of energy the hotter object is emitting not only more high energy photons at all wavelengths than it receives from the cooler object BUT it also emits significant numbers of photons at short wavelengths where the cooler object does not emit any at all. Greenhouse gas supporters always love to point out something like “a photon does not stick its thumb out to check the temperature – it is emitted anyway” and think this is some sort of proof of their simplistic misguided thinking. They imply ALL PHOTONS ARE CREATED EQUAL – which by the very basics of all radiation science is complete nonsense. The energy of any photon is defined as hc/lambda – h is Planck’s constant, c is the speed of light in a vacuum so the only variable in this equation is wavelength lambda. You don’t need to be particularly clever to easily see the higher energy photons have short wavelengths – as lambda increases the expression hc/lambda decreases in value. I presume all of the people espousing greenhouse gas theory and who have a PhD after their name can understand this yet they continually offer absurd explanations – kinda like the “heat” is hiding at the bottom of the oceans. A hot object emits significantly MORE photons at ALL wavelengths than a cool object does. In any exchange of radiation energy the net flow is always HOT -> COLD – always just as Physics books and the SB equation demonstrate. To my mind it seems impossible that a hot object can lose significantly more photons than it receives in any energy exchange with a cold object AND lose high energy photons that it simply does not receive from the cold object at all BUT backradiation can still make it hotter ??? I think anyone who proposes that is simply lacking in reasoning power. The solar radiation on the other hand contains huge amounts of high energy photons across a spectrum of wavelengths that are never emitted by anything on Earth. To equate the two based on a number – W/sqm. is simply childish – they have almost no characteristics in common – the solar radiation is orders of magnitude more powerful ! The greenhouse gas supporters seem to be poorly educated because the simplistic nonsense they quote seems plausible initially but can’t stand up to even a basic analysis ! Brown said in his steel greenhouse analysis that the shell becomes a source of power to the sphere but simply ignores the reality that the shell is always passively heated by the sphere and even acknowledges that the sphere is hotter as it emits double the flux in their ridiculous scenario. It is impossible for the shell to heat the sphere even if both are at the same temperature because even then there is ZERO net energy exchange between the 2. How do you heat something when there is ZERO net energy exchange ? The net energy flow is always from the sphere to the shell, the shell absorbs this energy and emits its own radiation – it can never emit higher frequency energy at shorter wavelengths than it is receiving because it requires the absorbed energy to simply sustain its own temperature as it is a passive absorber/emitter. It can never emit more than it receives YET this is required for any heating effect on the sphere – Q(net) must flow to the sphere to cause it to heat up and it simply cannot happen because in the unlikely scenario Brown proposed as his “proof” – both are at equal temperatures – there is ZERO net flow – Q(net) = ZERO = no backradiation heating. Exactly right Rosco, all of that. Indeed, this is a very good point: The hotter object loses high energy, high frequency photons that the cooler object does not replace! Man that’s a really great point to state it that way. To be absolutely fair, the luke-warmer GHG proponents will say that GHG have the effect of making the temperature higher compared to what it would be if the GHG’s were not there. In effect they are saying the flux of the loss of energy is reduced. If you are going to argue against them, you need to deal with all versions of their arguments. Photons are massless so cannot hold heat,. but they vibrate so transfer energy which is induced as heat into any body that adsorbs it. (but the transfer cannot be 100% efficient which is what entropic heat is, the little bit lost.). This is my simple way of trying to understand the process. Typo— To adsorb the energy the temperature must be lower than the emitter. @Opinionated. Yes indeed they have numerous versions of this idea they believe in, and they’re actually contradictory to each other. You would think this would hurt them, but the sophistry is so strong in them that what they do instead is that when one of the versions is debunked, then they change the argument to another contradictory version to throw off the trail. We’ve actually debunked them all. The trouble is the alarmists and the luke warmers have muddied the waters so much with ambiguous and inappropriate meanings of the GHE. I agree with your ‘flux loss is reduced’ comment; however, as I see it this applies only to heat which is transported by the state changes of water. The radiative gases which don’t change state can only help cool – for it’s purely by radiation that dynamic equilibrium with space is maintained. Nothing in the natural atmosphere ever makes the surface temperature hotter than it started, although water vapour, as described, is the only thing which I could live with being referred to as a GHE. The idea that CO2 molecules “trap” heat is a crock. Latent heat is the only thing that keeps the surface warmer because latent heat prevents cooling while the substance it is in loses energy without falling in temperature. It was discussed at length in my paper, Chapter 4. While reading an article on the water molecule, I thought it would be a good source for the discussions regarding the “greenhouse nonsense.” Water molecules are very dense, and there is substantial heat transfer during phase change–especially during evaporation. The warmer the air in the atmosphere, the more water it can hold. So, on a hot day (like in Verde Valley, Arizona during the monsoon season) the is a lot of water evaporated into the air. This valley has an elevation of approx. 3200 feet and is surrounded by the Mogollon Rim, which sits at an average elevation of 7000 feet, and in the late afternoon after a day of heat, thousands of clouds fill the sky (in the morning the sky is absolutely clear), then, a deluge of rain floods the area. This goes on everyday for about a month and a half. This process is amazing to see, once one realizes how nature provides local forces to reach equilibrium. The sun is doing that in real-time! The physical mechanisms must be based on heat equations that show a continuity of heat transfer through a system–a stage process from hot to cold—no additional energy can be added to this process after the “fact.” It completely violates what I have learned regarding first principles. Yes! You must have had a proper education. If all photons are effectively outside of space and time, then how does a photon from a warm spectrum source “know” to travel and warm up a cooler source? And if photons from a cool spectrum “know” not to travel and warm up a warmer source, then how can we see ice? You see visible light reflected off of ice, not the cold thermal emission wavelengths from the ice. The question about “knowing” comes from the people who ask how does a cool object know not to warm up a warmer object at a distance, given the radiative heat flow equation which says that this can not happen, along with the laws of thermodynamics. If photons are emitted how do they know not to heat up a warmer source when they get there. The spectral properties and microstates etc. are all about why. Do the cooler photons really travel the distance at all? Maybe not. What is a fact however is that radiation from a cooler source does not heat up a warmer source. So this effect doesn’t apply to all photons? And how would an infrared camera register the infrared radiation from the ice? A visible photon is much higher frequency than the thermal photons from ice, and it is reflected from an original source (sunlight, or a bulb) much much hotter than the ice in any case. It’s not the same effect at all. Some IR cameras are cooled so that they can see thermal IR, and some operate by measuring their own heat loss or heat gain relative to the thing they’re pointed at, and this is converted into a signal. As always, heat transfers from hot to cool. The radiation from ice doesn’t warm your hand or make your hand have to warm itself up. The premise refutes itself. It’s actually really great physics and math to learn. The ice radiates. The radiated photons have energy E=hf. What happens to that energy when the photon strikes your skin? I’m sorry but, do you really feel like radiation from ice heats up your skin? My skin feels warmed when it’s near a reg-glowing oven element, and such things. But ice? Radiation from ice doesn’t warm up your skin. You heat up the ice though. Whether you “feel it” or not isn’t the point. For now: the radiated photons have energy. Where does that energy go when it strikes your skin? By conservation of energy it must go somewhere. Actually, feeling heat, having a temperature raised by heat, is totally what heat flow is about from hot to cold. I am sure you are not here to propose that ice makes your warmer skin warmer still, since it doesn’t, and since heat doesn’t flow from cold to hot. By conservation of energy, and the heat flow equations, no heat energy flows from the ice to a warmer object at all. The continual error here of climate GHE mechanics is in assuming that heat energy flows from cold to hot, when it most assuredly doesn’t, and in obeying the law of conservation of energy. Read the OP again please. I’ve looked at this page,but have problems with the second figure. Who is saying the energy flux out of the larger sphere is the identical to the energy flux out of the smaller sphere? It isn’t…. No, because it also depends on thermal conductivities. If you touch a metal object in your house, it will “feel” colder than a wooden object right beside it, even though both are at the same temperature. You keep asserting this, but if energy is conserved, where does the energy of a photon radiated from ice go when it strikes an object? This to me seems the fundamental question, and it’s much simpler than the case of two concentric spheres you linked to. You keep answering my question by asserting the very point that I am disputing. That doesn’t work logically. My example can’t be clearer. An infrared photon is radiated by ice, and it has energy hf. That photon strikes my skin. What happens to its energy? [JP: You are disputing the laws of thermodynamics? You are disputing that heat only flows from hot to cold? You are disputing that ice feels cold, not hot? You are disputing that radiation from ice doesn’t make your hand raise in temperature? These are strange things to dispute, the least reason of which you can empirically sense the results, and the strongest reason of which they have no thermodynamic foundation in physics. PS: And I *am* using the laws of thermodynamics here — the first law, that states energy is always conserved. So the photon’s energy must be accounted for. Now you’re claiming that ice doesn’t melt if left out in the sun? Really?? A photon has left the ice. How can its energy “stay inside the ice” if the energy-carrying photon has left it? 1) Do you agree that a ice radiates electromagnetic radiation? 2) Do you agree that electromagnetic radiation carries energy? 3) So if that radiation strikes an object — any object — where does its energy go? [JP: From 1 & 2 you can not simple-mindedly infer a claim that cold therefore heats up hot, as is the intention behind your 3. Physics has progressed to a bit more sophisticated analysis than that. You keep asserting that “a cold object does not send heat energy to a warmer object,” but you haven’t proved that. In fact, that very assertion violates the First Law of Thermodynamics. Of course it does. Do you think the photon turns around in mid-stream and goes back to the ice?? Radiation carries energy, and energy warms things up, regardless of its temperature. The proof is obvious — all objects radiate EM radiation. All EM radiation carries energy. That energy is transferred to an object when the EM radiation strikes it. “From 1 & 2 you can not simple-mindedly infer a claim that cold therefore heats up hot, as is the intention behind your 3? Then where does the energy of the emitted photons go? Where? [JP: I’ve already answered that. You keep repeating this as if it’s obviously true. It’s not, and you haven’t proved it, you’ve assumed it. Where is that proof? So on the “side” (whatever that means) of the ice facing a warmer object, no radiation is emitted from the object? In other words, on that area (to be determined) of the ice, sigma*T^4 = 0? Is that your claim? You are a patient man. Would this help David Appell? Every single thing in the universe is trying to cool on a one way trip to absolute zero. When other heat sources are encountered, the one way trip continues; however, the rate of cooling of cooler objects is delayed (the water in the ice cube warms). The rate of cooling of the warmer object is also delayed by the presence of the cooler object, but never, ever, is the warmer object made still warmer by the cooler object. That wouldn’t be one way cooling, which is a violation of the 2nd? LOT. That, in words, is what the heat flow equation says and it is also observed in nature. If you drop the ice cube in your kettle it won’t boil quicker. I don’t think these people seek to be helped Tom. They help me making the argument for the truth better though. OK I think I see why we’re talking past each other. First, if you wish to refute the fact that heat only flows from hot to cold and that only a hot object raises the temperature of a cool object, not the reverse – if this is your wish – then please do that elsewhere. As this is the usual context for climate greenhouse pseudoscience, that’s the context I’ve been trying to help you with. However, secondly, your question can be answered by simply saying that the radiation from the cool object replaces a necessarily smaller portion of the energy that the hotter object loses. That’s where the radiation from the cooler term goes, and is why I keep referencing the equation Q’ = A*σ(T2^4 – T1^4) because it gives that answer. No heat energy is sent from cold to hot, which is a result of the balance of their fluxes. And that is where it should be left at. That’s some valid semantics you’re pointing out there and making me see, so, thanks for helping me make it more clear now. The error that the climate greenhouse pseudoscientists go on to make is to then say that this proves that cold heats hot, and so that specious argument is what all the trouble is about in debunking. The replacement of a portion of the warmer object’s thermal emission by the cooler object’s, i.e., Q’ = A*σ(T2^4 – T1^4), does not translate to the cool thing heating up the hot thing, as this is simply not what the equation says; only the cool thing receives heat. The hotter T2 curve emits more than the cooler T1 curve. The difference between them is how much heat is transferred only to the cooler object, and the magnitude of the difference goes on to determine the rate of temperature increase for the cooler object. Spot on now Joe. You should bottle that last reply (8:03 pm). Any subsequent wriggling or attempts at unpicking the physics or (easy) maths amounts to no more than wilful obtuseness. Sadly, this is likely to occur as individuals see their belief system crumble before their eyes, with the sudden realisation that they have been systematically lied to for decades. Oddly, Hansen et al briefly got it right in a NASA paper he contributed to in 1976. In lines 8 & 9 it states “… and reradiation at the local temperature;…”. They subsequently forgot the importance of this statement and went for the “blanket” schtick. People who should know better have been peddling this pseudo science for years, to their great enrichment. Governments are now taxing breathing, based on this ‘blanket’ nonsense. Just think about that. It shows that bad people who control the mass media and education can get the bulk of a population to believe anything. Indeed Tom. I honestly think it is supposed to be a new pseudo-religion with a new state system to regulate it and keep the masses in line. It will be just like the Dark Ages with the Catholic Church. All of the archetypal elements are there. BTW not sure why your comments keep going into moderation…I don’t know why its happening. The proof is obvious from Maxwell, Planck, and Boltzmann. Where is your evidence that thermal EMR flux in the direction of a higher temperature (radiative potential, or field strength) has ever been detected, observed, or measured? Fantasy only. Not at all! Sigma*T^4 does not exist! Half of a S-B equation, is not an equation. Boltzmann was very careful with arithmetic precedence. Parenthesis must be evaluated firstly. It is your fantasy of half an equation, that rises not to the level of conjecture. Such fantasy has not once been observed. 4) Therefore, when the electromagnetic wave/particle impinges on another object, that energy must be accounted for. It either reflects or is absorbed. That does not translate to a cooler object making a warmer object warmer, for the reasons which have been given. That’s absurd. The S-B law is very clear. Objects don’t sometimes radiate, and sometimes not radiate. They always radiate, regardless of their surroundings. “The total energy radiated per unit surface area of a blackbody per unit time…is directly proportional to the fourth power of the black body’s thermodynamic temperature . That does not translate into a cooler object making a warmer object warmer. Radiation from a cold source doesn’t warm up a warmer source because Q’ = A*σ(T2^4 – T1^4), thus heat only goes from hot to cool. None of your examples are examples of cold heating up hot, which of course there is no evidence for anywhere since we all know that reality doesn’t do that. The context of the statement was for radiation from a cool source heating up a hotter source. Q’ = A*σ(T2^4 – T1^4), therefore radiative heat energy doesn’t flow from cool to hot. The emission of either source are fully accounted for, using the S-B Law. Can the insults and condescension — it weakens your case. I have a PhD in theoretical physics. So I know a few things. You don’t seem to know this: Q’ = A*σ(T2^4 – T1^4), therefore radiative heat energy doesn’t flow from cool to hot. The emission of either source are fully accounted for, using the S-B Law. And that’s much less basic than any PhD in physics I’m aware of. So despite your claim to want to discuss the science, you only want to discuss it with people who agree with you. Which is dogma, the opposite of science. Have you ever submitted your manuscript to a real scientific journal for peer review? Look, you’re not going to win that argument against mainstream science and thermodynamics by going through me. You should create your own website or blog and put your ideas out there for the world to see. I can’t help you with your dream. Plus you should write some scientific papers demonstrating how cold heats up hot, etc. Good luck! Which government(s) is(are) taxing breathing? Breathing is carbon neutral, since the carbon in the CO2 you exhale comes from the CO2 you inhaled, or that taken up by the plants you eat, or the animals you eat who themselves at plants. That’s why atmospheric CO2 levels were essentially constant for millennia before the Industrial Revolution, despite a lot of humans and animals breathing. And now we’re returning life-creating CO2 back into the atmosphere from where it has been sequestered underground due to geology and time. We get cheap energy, and the biosphere gets food and more life. Win win. The circle of life. Historical CO2 levels, geologically speaking and evolutionarily, were much higher than the past few thousand years. The biosphere needs more CO2 back in the atmosphere. Of course I understand that equation. It’s your interpretation of it that’s flawed. You claim that sometimes objects radiate and other times they do not, as if the object magically knows what is in its surroundings and then makes some kind of decision about when to radiate or when not to. There’s no such decision going on in that equation, nor is that an interpretation I make. A complete Straw Man from you now…lol. No magic decisions being made there! Just the laws of physics. And the comment about Venus…hilarious. And no, CO2 has never caused global warming in the past. Now remove the warmer object from the picture. Does the colder object begin to radiate? You are claiming that energy isn’t conserved — in violation of the FLOT. You’re claiming objects only radiate when they’re surrounded by colder objects, never when they’re surrounded by warmer objects. Or else you’re claiming that the photons emitted by a cold source carry no energy. Does a cold source emit photons? So which of these four fundamental principles of physics do you disagree with? Does the ice cube radiate energy? Does it stop radiating then it’s dropped in the water? Besides, this is a bad example, because there is too much else going on — heat loss due to vaporization and conductivity, in particular. And what carries heat from one object to another, when they are not in contact and in a vacuum? Electromagnetic radiation. So you’re statement is equivalent to saying the colder object doesn’t emit electromagnetic radiation. [JP: Q’ = A*σ(T2^4 – T1^4), therefore heat energy doesn’t flow from cold to hot, and the emission of either source is fully accounted for by their respective S-B Law terms. If cold objects don’t radiate, how did Penzias and Wilson detect the 3 K cosmic background radiation? They cooled their detector to 4 K, to remove the interference of radar and radio waves, and from heat in the receiver itself. 3 K < 4 K, yet the 3 K radiation was detected. [JP: Straw Man. No one claimed that cold objects don’t radiate. Q’ = A*σ(T2^4 – T1^4). And that radio wave detection was not a thermal detection, but about radio waves effect in moving electrons in a metal antenna – this is not about cold heating up hot, and so you’re also doing Red-Herrings now. It sounds more like you have a theoritical PhD in physics. JP fully answered your lack of understanding in his response at 2014/11/23 at 8:03 PM. Note that all this was also covered in his original blog text. You make no mention of the explanation that a cooler object’s radiation merely fills in some lower energy microstates which the warmer object is shedding. The effect of this is to delay the cooling of the warmer object by some amount; however, as the warmer object continues to shed energy from more energetic microstates, which do not exist in the cooler object, it continues to cool. It never warms beyond its original starting temperature by any action of any cooler object, because, it is, overall, losing energy faster than it gains it. This is 1st year physics stuff. That you don’t, can’t or won’t understand this leaves me to conclude that you are: wilfully obtuse; faith-driven; or both. BTW, the original whinge from the alarmist bedwetters was that too much CO2 was being put in to the atmosphere. Lately, camp followers and zealots write that “carbon” is the issue. Surely a PhD in any scientific discipline would know that accurate and consistent notation must be used. Lastly, exhaled CO2 is ~4.0%, compared to 0.4% inhaled. Half a equation can only absorb when opposed by a greater field strength. Please demonstrate any thermal radiative flux (Power/m^2) in the direction of higher radiative field strength? What total BS, From Emmy Noether’s theorems,(1917) no energy within a gravitational field need be be conserved. EMR and Gravitational potential are in different gauge groups. Please go somewhere and get an education! Please demonstrate any thermal EM, wave, particle, energy, “even generated” let alone exiting in a direction, toward a higher opposing EM field strength? All fantasy! World class nutcase. Check out this rant. Also, a very special tidbit—Mr. Appell stated the Laws of Thermodynamics do not apply to the atmosphere—he posted this comment a Judith Curry’s blog. Oh now it really makes sense…lol. How convenient for alarmists to pick and choose when the laws of physics apply! And he accuses us of picking and choosing when a cold object radiates?! JP, on another comment for another of your postings, I exclaimed that I thought it to be a mistake to engage in banter with Appell, for I have a great deal of experience with Mr. Appell. I would hope that you are not realizing my sound advice. Mr. Appell is a 100% sophistical liar! … Nothing, and I mean absolutely nothing can be gained by engaging with him. I highly recommend that you throw him into the spam dustbin. He is just sucking up your valuable time. That is his purpose in life. He is a time vampire! .. and he is not .. I repeat NOT a PhD in anything other than sophistry. He is a full on, 100% lying machine. P.S. I do indeed enjoy your rebuttals however. Both entertaining and educational for me. But I still implore you, trash the guy. I have heard it all from that turd. Also, I see that John posted your “The Steel Greenhouse Debunks the Climate Greenhouse Effect” article over on PSI. I just had to read it all over gain. Such great stuff! … Keep up the tremendous work my friend, and have a wonderful Thanksgiving Holiday! Jeff, I see through these people instantaneously. That’s why I call them names and rough them up, because I believe in giving a good beatin’ to those types of psychopaths who lie and seek to do harm on purpose. Alas, people don’t like seeing that…lol. I guess others don’t see it as clear as I do, and who these people are etc. Just like Ed Bo, and the guy before him: instant recognition of liars and fraud, sophists and obfuscators. How disgusting do these people have to be to spend time thinking how to be full of crap? On the other hand, it serves a purpose for me in learning all of their repertoire, and improving my explanations of the truth and my form and syntax and semantics etc. So, who knows, maybe they’re here to help in some way. I was going to trash David after his hilarious comments yesterday, but he hasn’t showed up since. Did you know that the reason why Venus has no plants because it has so much toxic CO2? What a great factoid, I didn’t know that. LOL! I find this explanation by Claes Johnson quite compelling. Allowing for the concept of radiation moving both ways between a hot and a cold object can only ever let the warmists continue arguing (like Appell here) that the energy carried by this ‘counter-radiation’ somehow needs to be accounted for. But it is only a concept, a theoretical principle. The two-stream model is not something that has ever been empirically observed. It cannot be physically observed. Because the radiation is all integrated into one continuous field. The only thing that can only ever be detected is the actual transfer of energy through the field, the flux, the heat. “Computational Blackbody Radiation describes radiative energy transfer as a resonance phenomenon between resonators connected by standing electromagnetic waves in a vacuum between the resonators. The acoustic analog is depicted above: Energy is transferred from one tuning fork to another by standing acoustic waves as pressure variations in still air. In this model the finite speed of electromagnetic (or acoustic) waves only influences the energy transfer in a start up phase, while in a stationary state of standing waves the energy transfer can be viewed to be instantaneous without time delay, or to be without time aspect. The transfer of energy is one-way from hot (high frequency) to cold (low frequency). That is all quite excellent okulaer. The problems to physics, and with climate pseudoscience as a minor side note but example of what can go wrong with science when it adopts already-debunked materialist principles, actually lie in understanding just what the photon actually is and what it is doing or representing. Claes’ work is precisely in that direction. Appell is an idiot I used to chase around Disqus forums. He can’t even fathom how conduction works. If he could, he’d understand why an object radiating energy of a certain level concentration, won’t absorb any of the identical spectra it’s emitting. All Magic Gas hicks believe that – because they’re too stupid to know how energy conducts through matter, it must not be known. Not only is it known it’s well accounted for. Photons from cooler objects striking warmer ones, bounce off. They are not taken in, for the identical reason water trying to flow into a pipe water is coming out of, is rebuffed. For the same reason an air tube giving off air at a certain psi, won’t stop giving off air until the external psi are equal to what’s in the tube. I’ve seen Appell try to whore his ignorance about what makes electrons distribute energy through a solid and emit it out of the other side for four or more years now. His F***d up education left him in the same position JoeldShore and Willis Eschenbach, and Anthony Watts are in: too f****g stupid to know hot from cold.